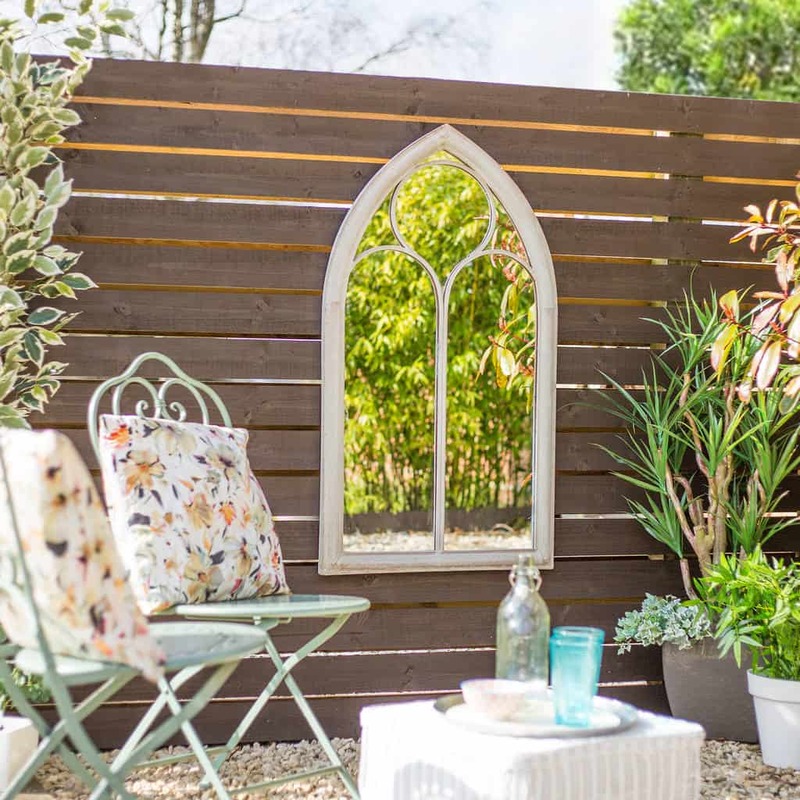 We’ve sourced 77 of the best garden DIY ideas. 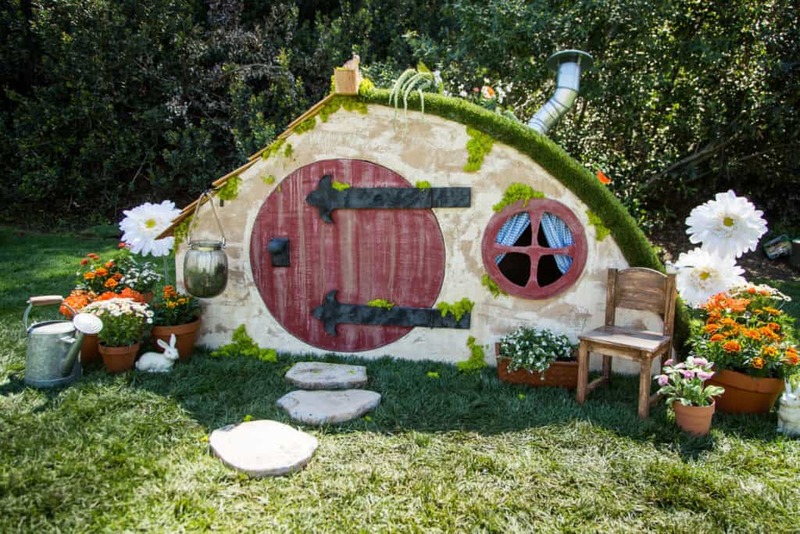 Give your kids the playhouse of their dreams while indulging your Lord Of The Rings obsession with this quirky hobbit house! This is one project worthy of your time and effort. Plan it right and you can have a daytime play space that transforms into an evening Shire reading nook for adults to enjoy. 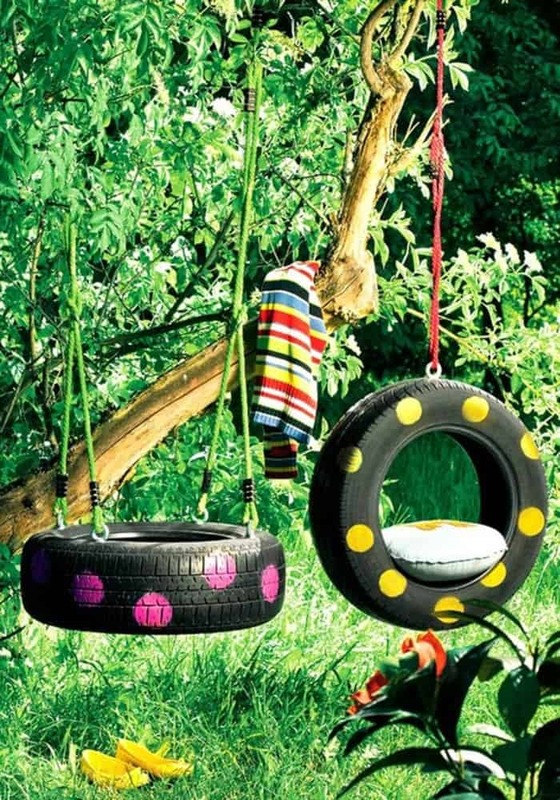 Give the classic tyre swing an updated look with some brightly coloured suspension rope. Why not give the kids creative license to paint their own designs on the rubber? Add some outdoor cushions for maximum comfort and this will easily become a garden favourite. 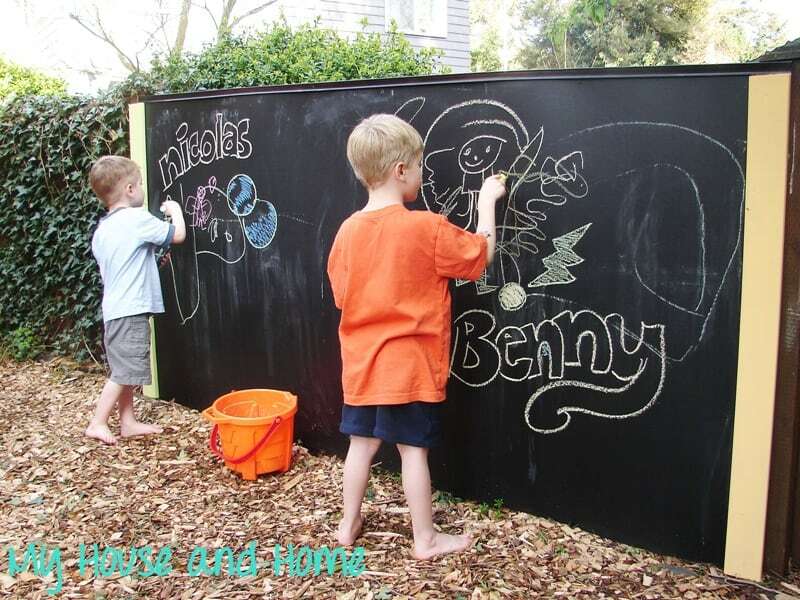 Keep your little artists entertained during the summer months with this fantastic outdoor chalkboard. All you need is some backing boards and chalkboard paint. 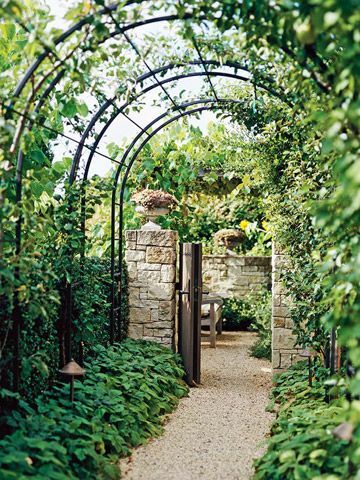 This terrific feature blends in perfectly with the most tranquil gardens. No more matchbox cars lost in the expanse of lawn and bushes! 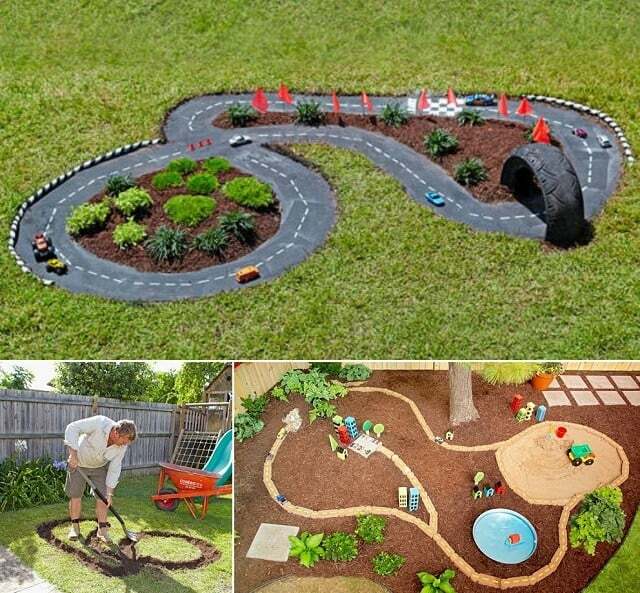 Keep your mini racers on the straight and narrow with a DIY race track. You can even plant a little shrubbery in the grassy centre. Don’t throw out that broken old skateboard! 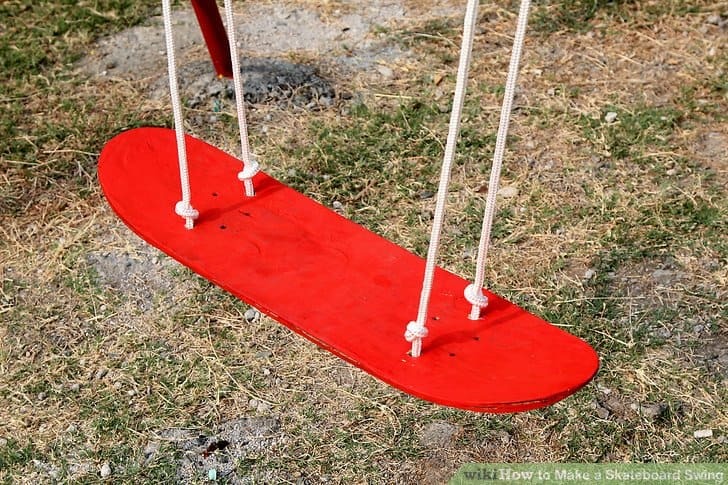 Remove the wheels and sand it down to create this fun side to side swing. These make a great addition to any custom built jungle gym. Got a crazy golfer on your hands? 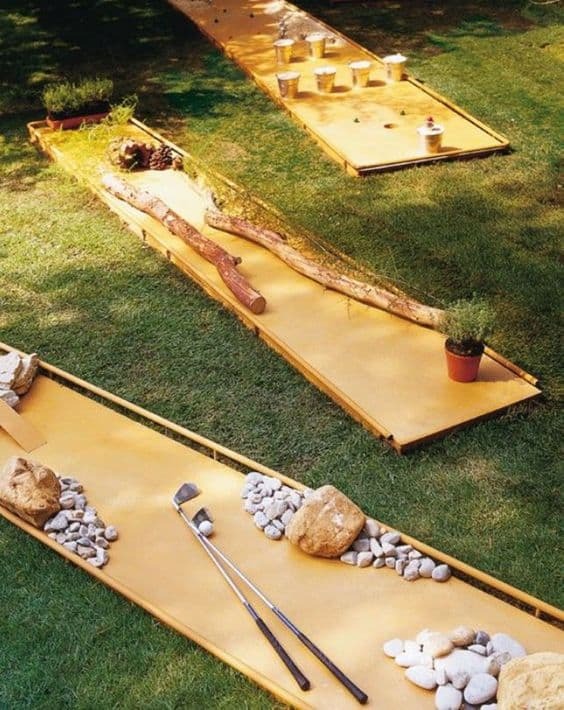 This mini golf course is fun for all the family and all it takes it some wood to build the frames and some imagination to design the obstacles. Your kids will be busy perfecting their putt all summer long! 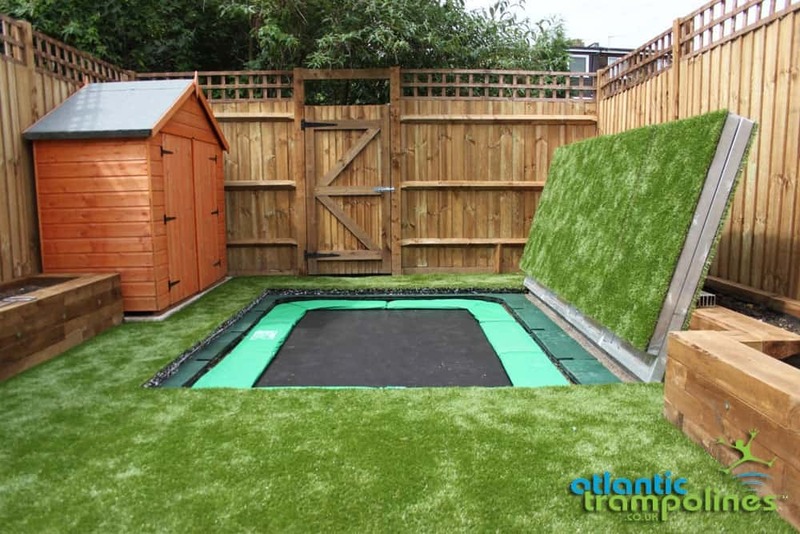 Less intrusive and not as dominating as its traditional counterpart, a sunken trampoline is the perfect solution for keeping an open feel to your garden. It’s as easy as digging a big hole. What are you waiting for then? 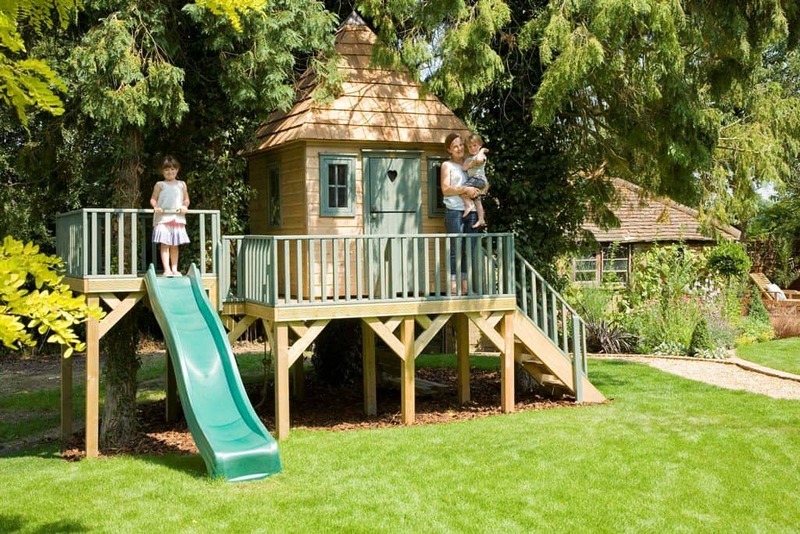 A great treehouse is the ultimate childhood cubby. The best thing about building your own is the total control you have over the design. Keep adding to it over time and you’ll have a luxury tree complex. And you don’t even need a tree to attach it to! 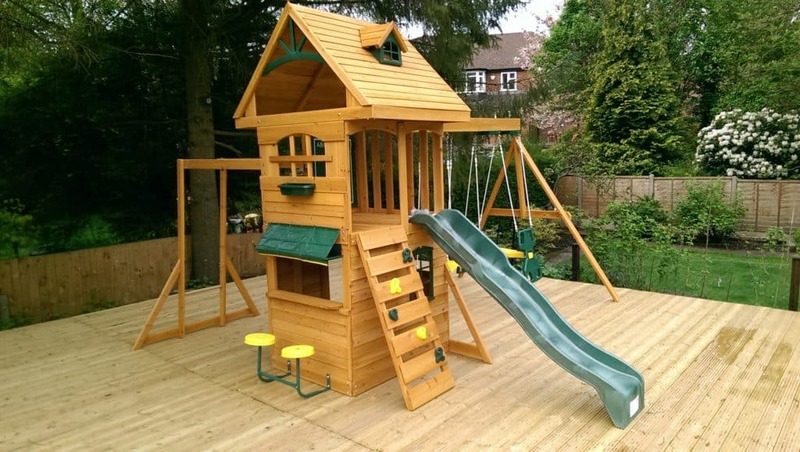 Let your mini explorers burn off steam outdoors with an awesome climbing frame. Slides, swings, monkey bars and rope bridges are popular features. Just remember to lay a good layer of soft bark or rubber tiles to save those little hands and knees. A fun weekend craft for the whole family to help with! 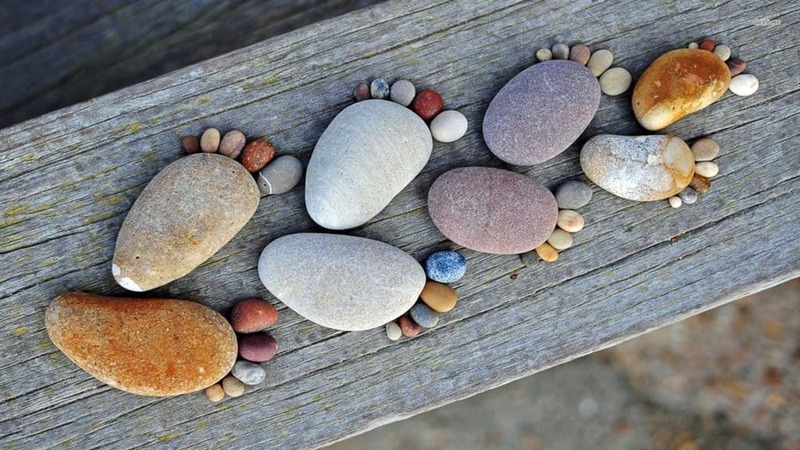 Toddlers will love trying to find little pebbles to match the size of their feet. Older kids will delight in painting names and designs on the stones. Why not make it a yearly tradition? The old games are the best! 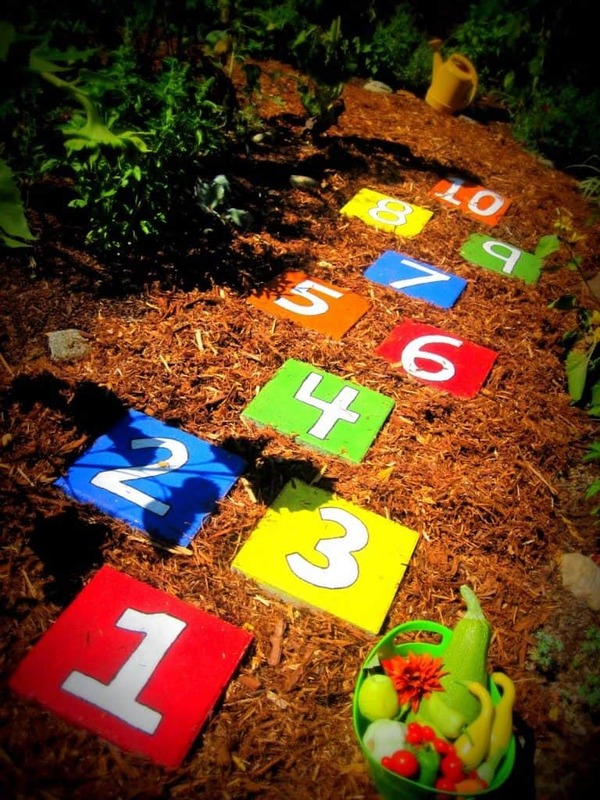 Indulge in some childhood nostalgia by creating a hopscotch that will be enjoyed by family and friends for years to come. All you need is some garden pavers and a pot of paint. Enjoy entertaining outdoors during the summer months? Bring the spirit of the holiday beach bar to your garden with your own garden bar. 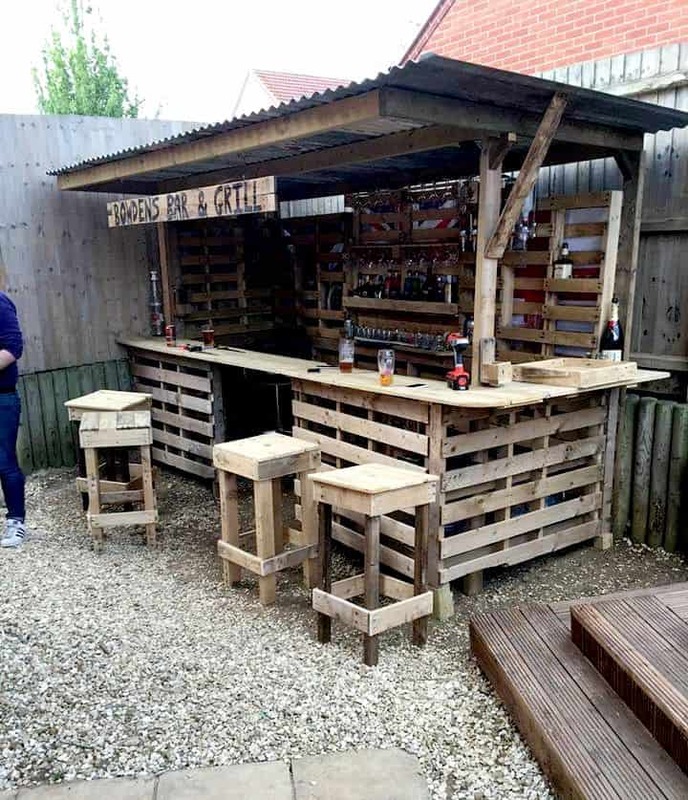 Amazingly, all you need is your tools, a few pallets and some corrugated aluminium for the roof. Martini anyone? Outdoor dining furniture doesn’t have to be boring and expensive. 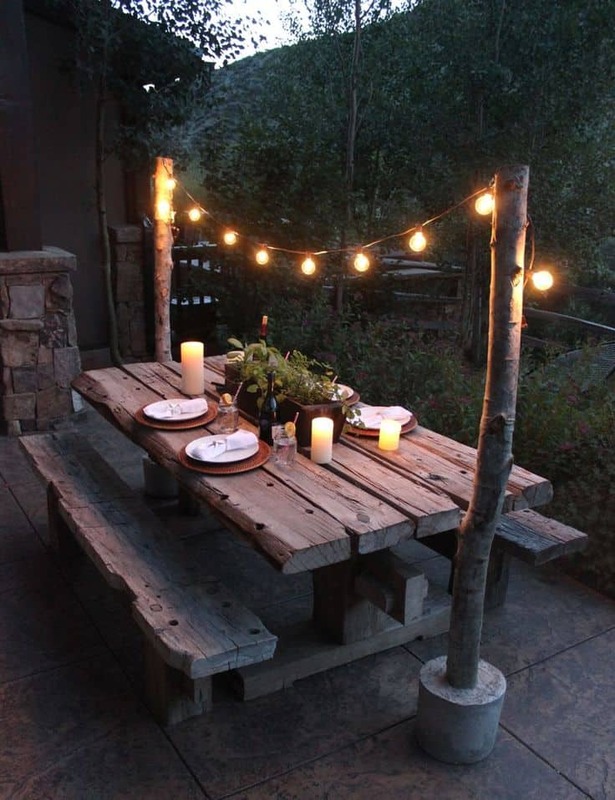 Breathe your own personality into your garden with a custom built table and chair set, or else give some life to your existing set with a string of overhead lights. Craving a deep dish? 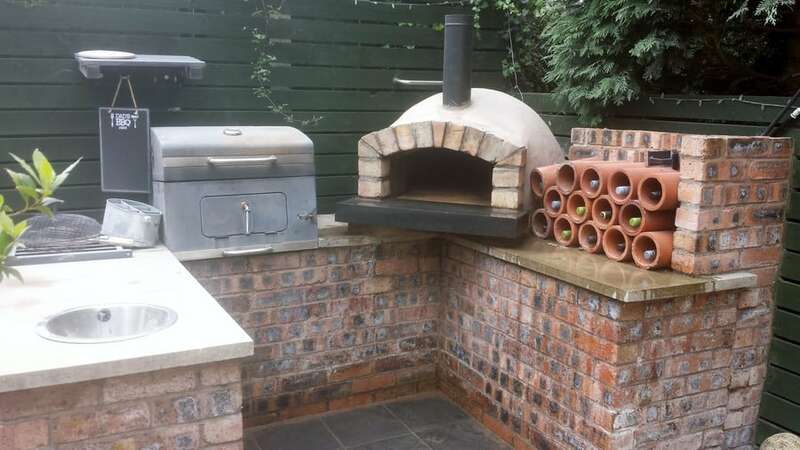 Cook up an authentic Italian feast in your very own wood fired clay oven. It’s not as complicated as it sounds! This oven isn’t just for pizza, it’s also ideal for slow cooking larger joints of meat too. Bon appetite! A good barbecue is a must-have for any serious carnivore. 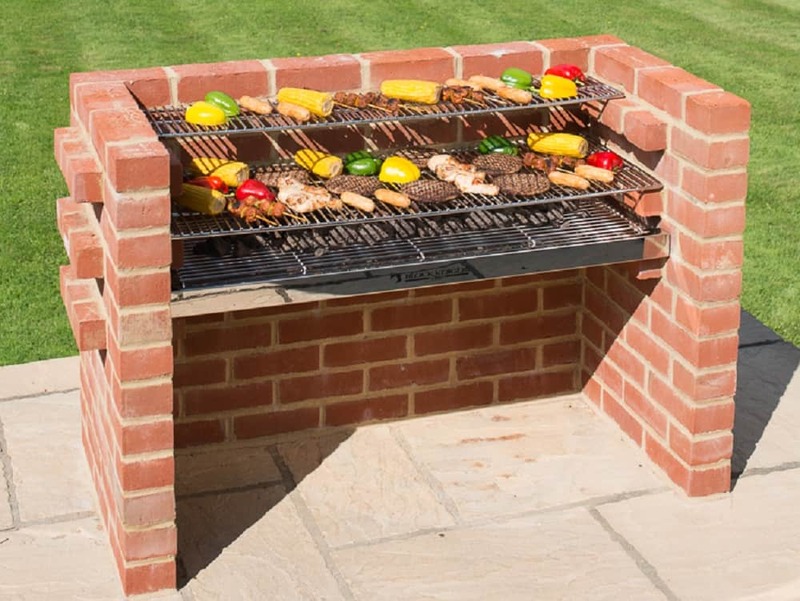 Why not build your grill a permanent home? A grill station is the ultimate outdoor culinary feature, perfect for both elegant entertaining and everyday use. Gather round and grab a bag of marshmallows! A fire pit is a great focal point that allows you to continue enjoying your garden long after the sun has set on those cooler autumn evenings. No special masonry skills needed, it’s as simple as laying a few bricks. Love a refreshing glass of Sauvignon Blanc? 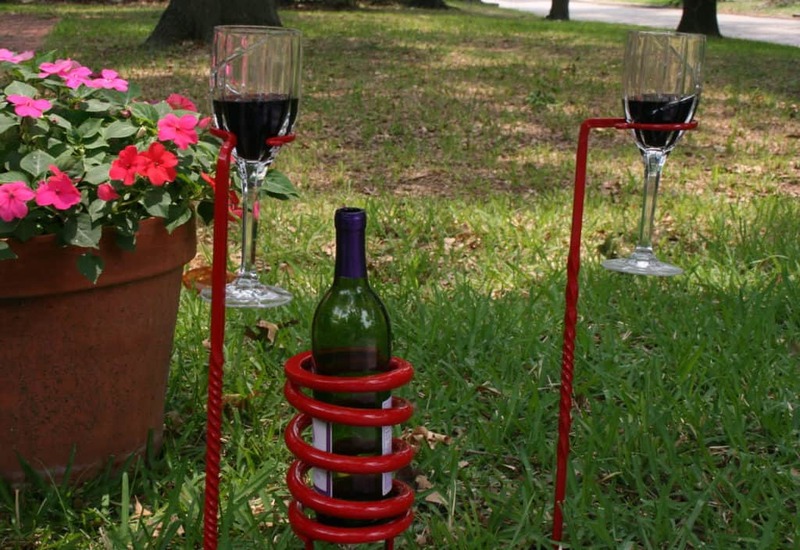 Then this quirky bottle and glass holder is the perfect adornment for your lawn. Position in the shade next to your deckchair and enjoy. You don’t need a dedicated smokehouse to smoke your meat. 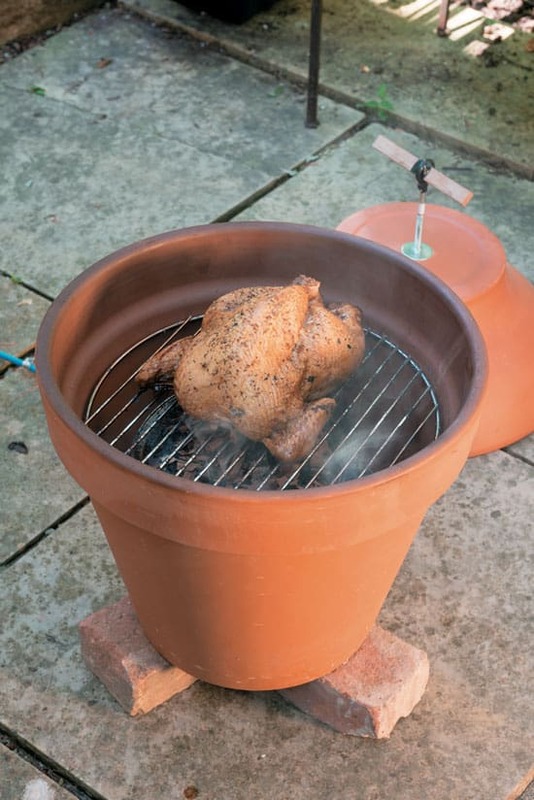 These terracotta pot smokers are compact and easy to build, without compromising on flavour. A small hotplate, a pot, a grate and a cover will have you on your way to smoky heaven! 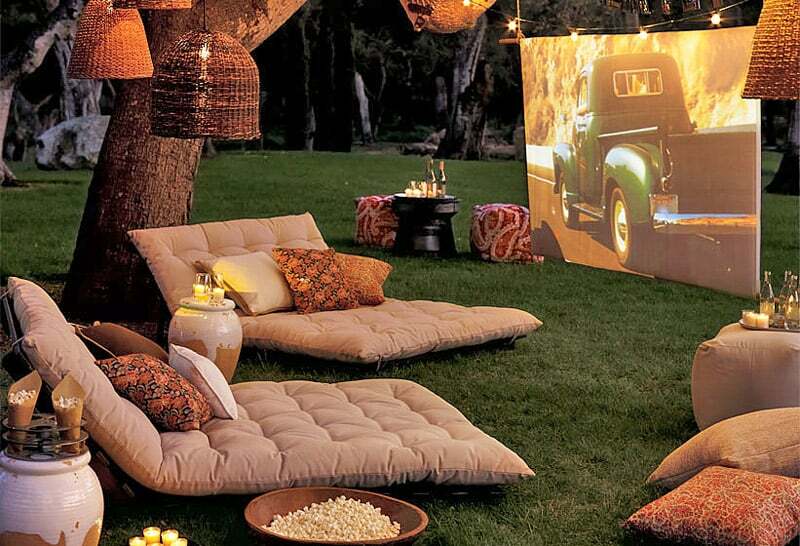 Host a party with a difference by creating your very own garden cinema. A projector and a decent set of speakers are a must and although you can use a bedsheet, it won’t reflect light so if you’re serious about your al fresco movie nights, it might be worth investing in a proper projector screen. Running out of fridge space? Keep your ice cold longnecks within arms reach with an integrated drinks cooler. 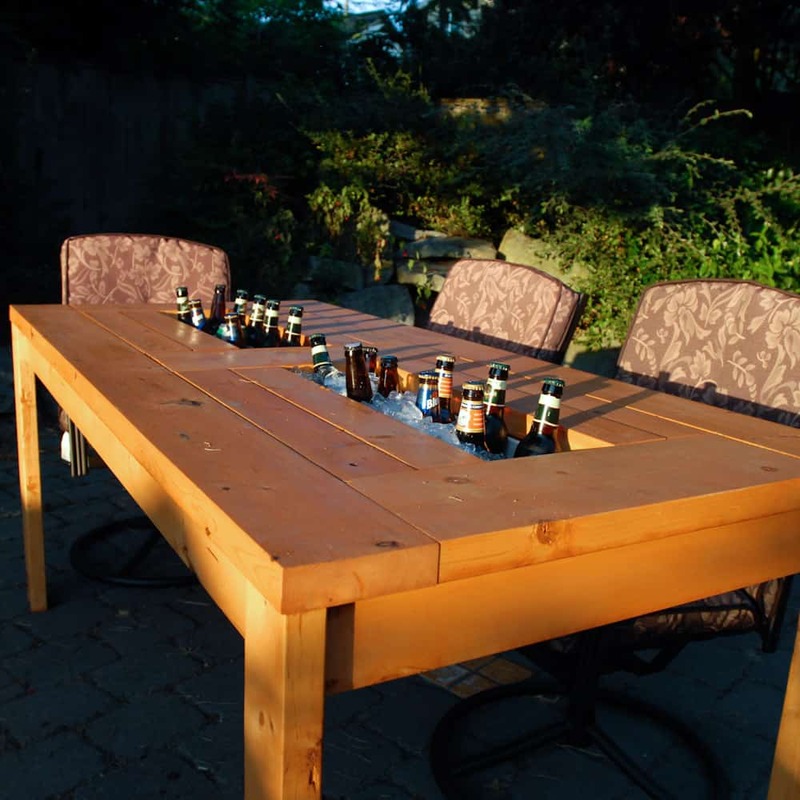 This makes great use of your patio table space and can be covered back over when not in use. What better way to relax in the evening than outdoors in a bubbling tub of bliss? 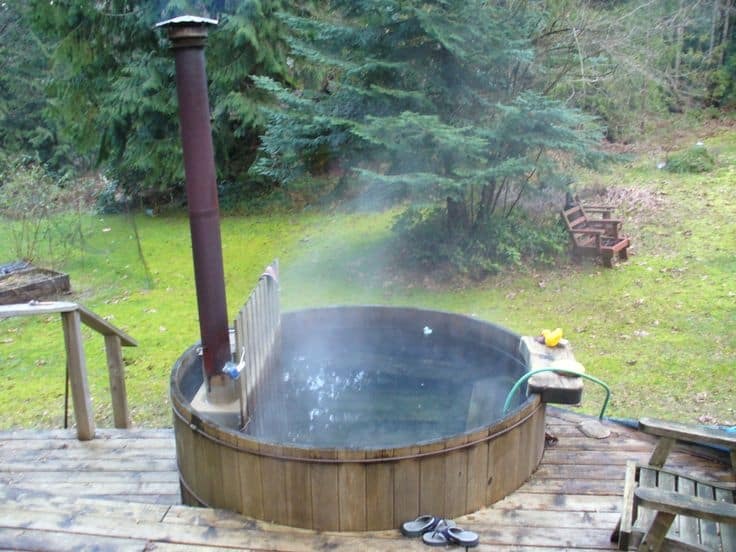 Be the envy of all your friends with a wooden hot tub. 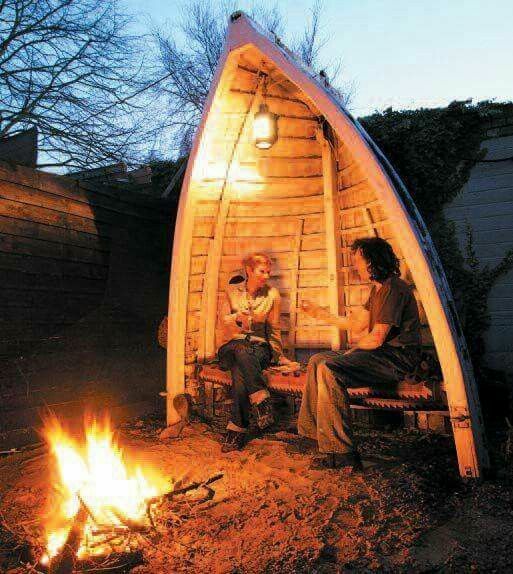 All you need is wood, water and a match. 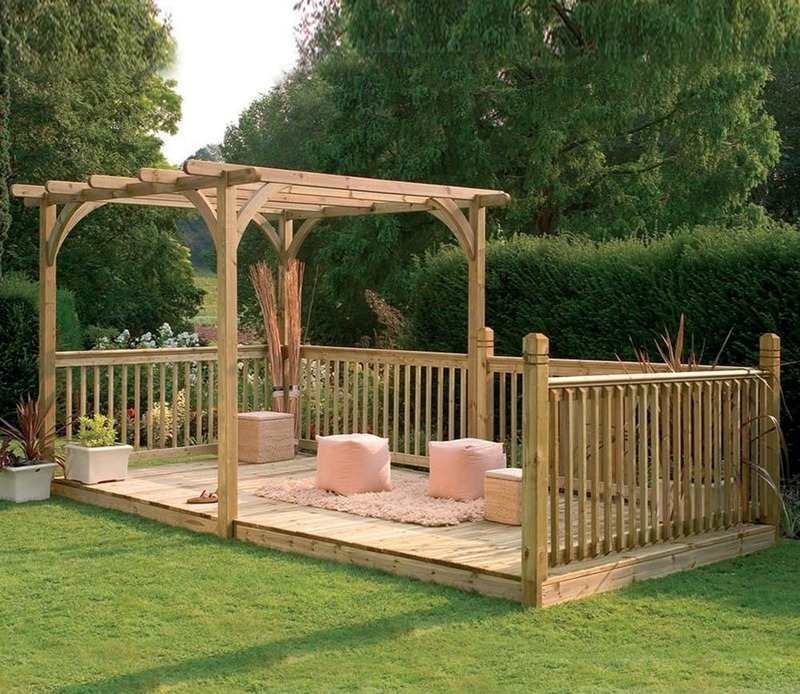 Whether you’re in need of some shade or you simply want a defined garden seating area, a pergola is a wonderful feature for any garden to have. You can buy flat packed pergola kits but if you’re handy with a hammer and saw, it’s just as easy (and a lot cheaper) to custom build your own. 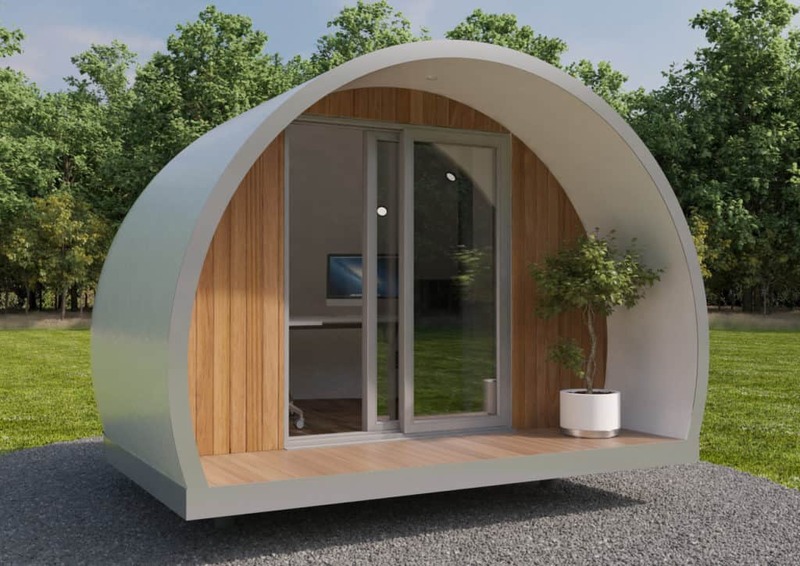 Garden pods give a lovely sheltered nook for reading or relaxing no matter what the weather is. Brighten it up with some planters and a selection of vibrant upholstery and outdoor cushions. 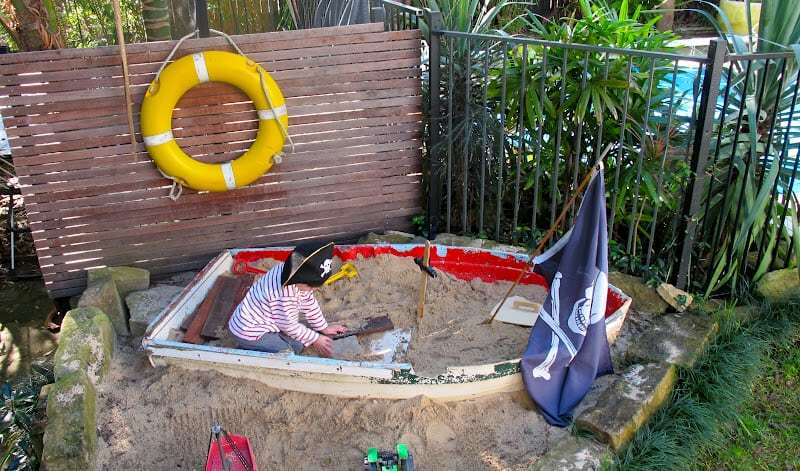 A fantastic feature for anyone who loves the nautical life! This little seating alcove is the ideal place for those philosophical discussions that last long into the night. Position it close to your fire pit and surround with solar powered lanterns. 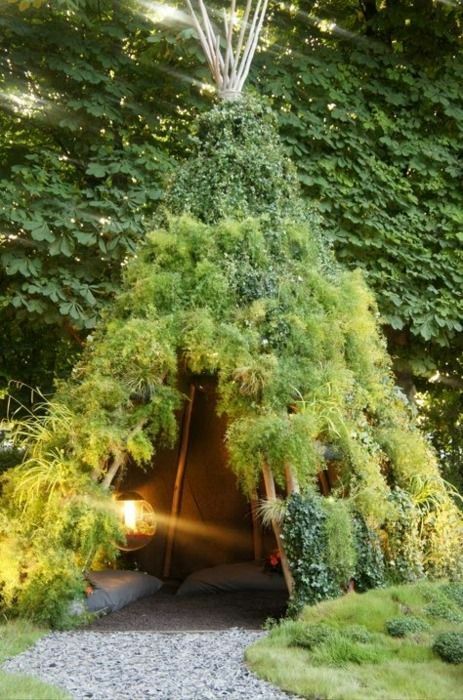 A garden teepee is the perfect spot to meditate and reconnect with nature. 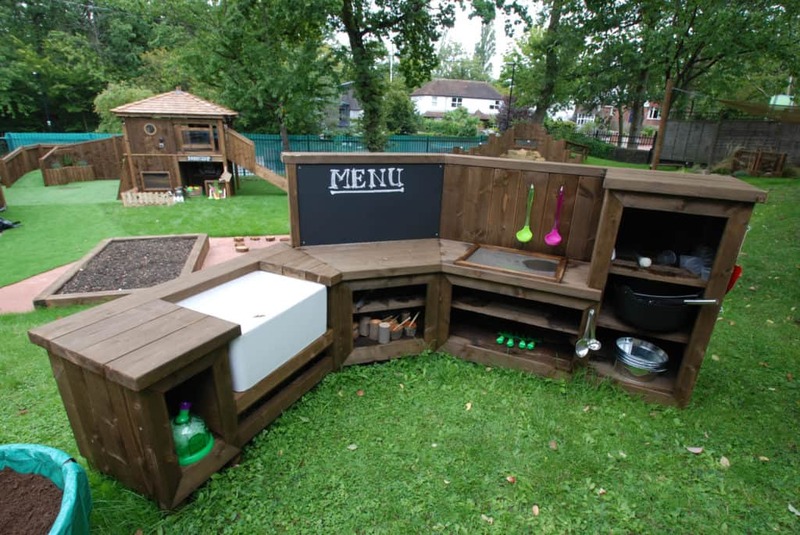 It also makes an excellent cubbyhole for the kids, while serving as a great display for all your creeping plants. Who doesn’t want a peaceful niche for catnapping those lazy Saturday afternoons away? 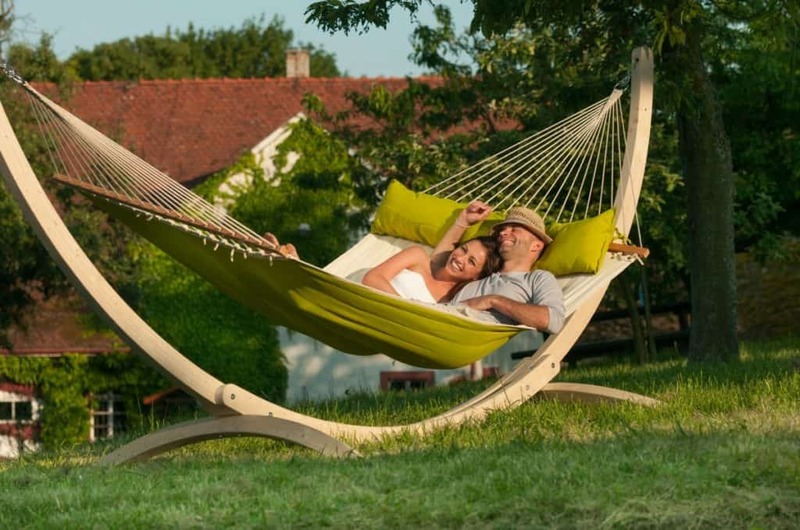 Hammocks are no longer a basic sheet tied precariously between a few trees. Blankets and cushions give added comfort and style, making a hammock the perfect place for kicking back and reading the weekend papers. Keeping your tools in order is the key to having a tidy, organised garden. 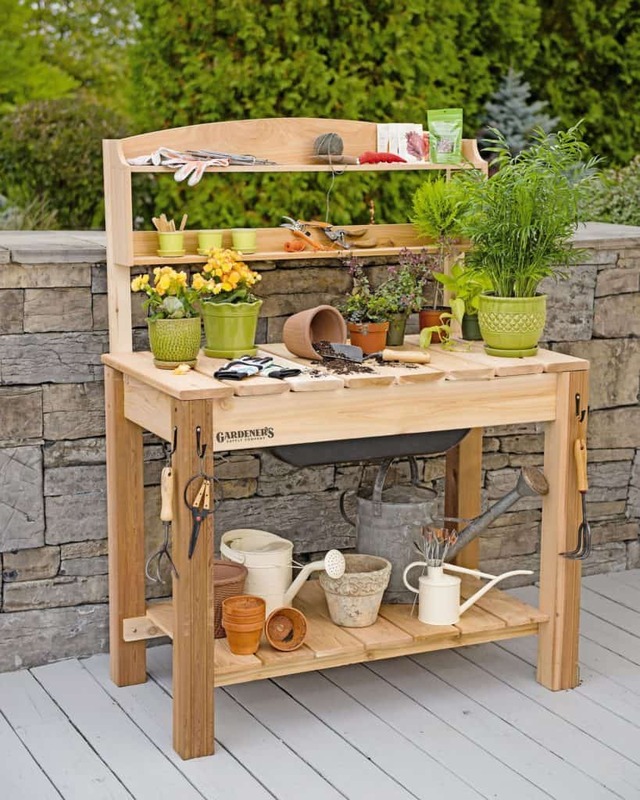 So why not build your own garden work bench? 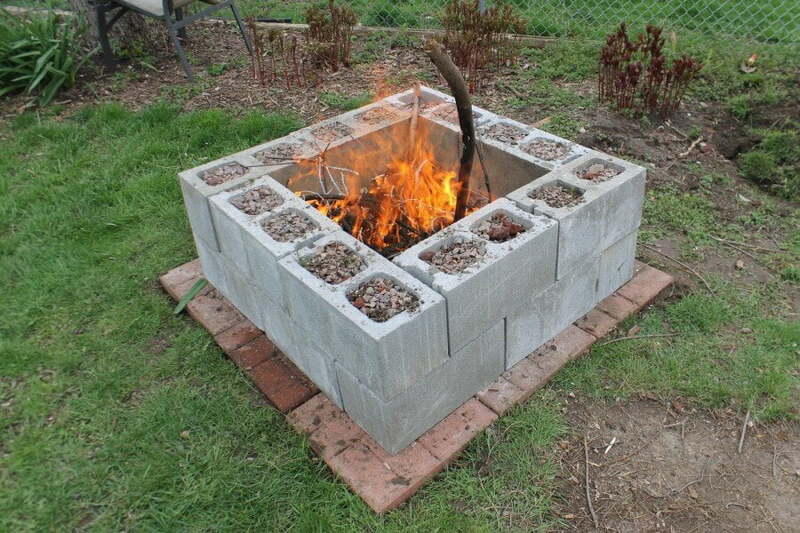 A simple unit can be thrown together cheaply with a few pallets. Sand it down and paint it for added style. 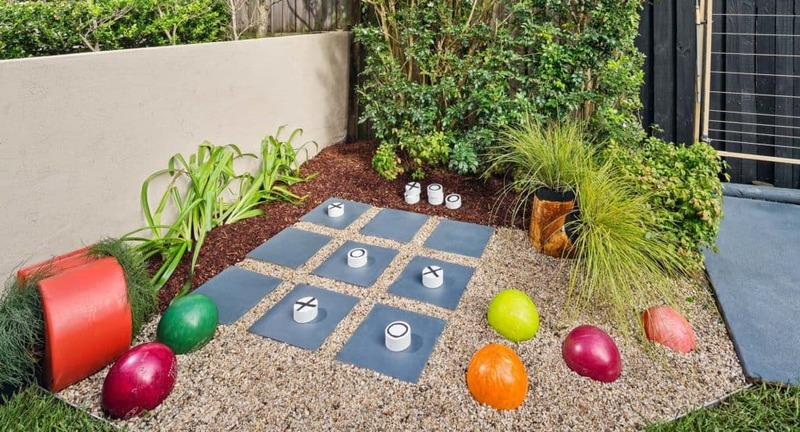 Need to infuse some life and colour into your concrete jungle yard? 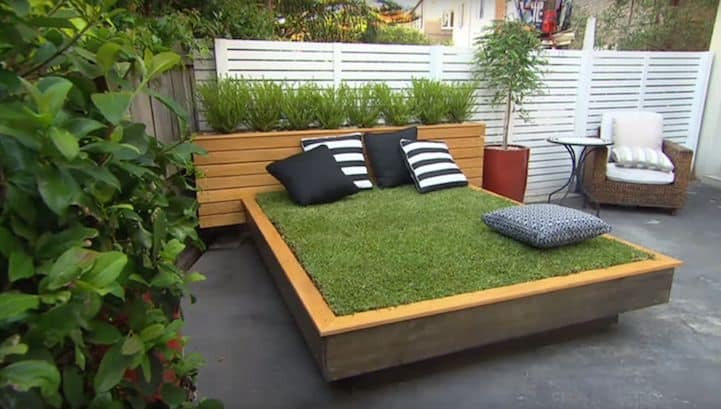 A garden bed is the perfect solution, giving your outdoor space a patch of grass which also serves as a great spot for basking in the sun. A straightforward elevated frame and a layer of astroturf is all it takes to give your garden a blast of nature. 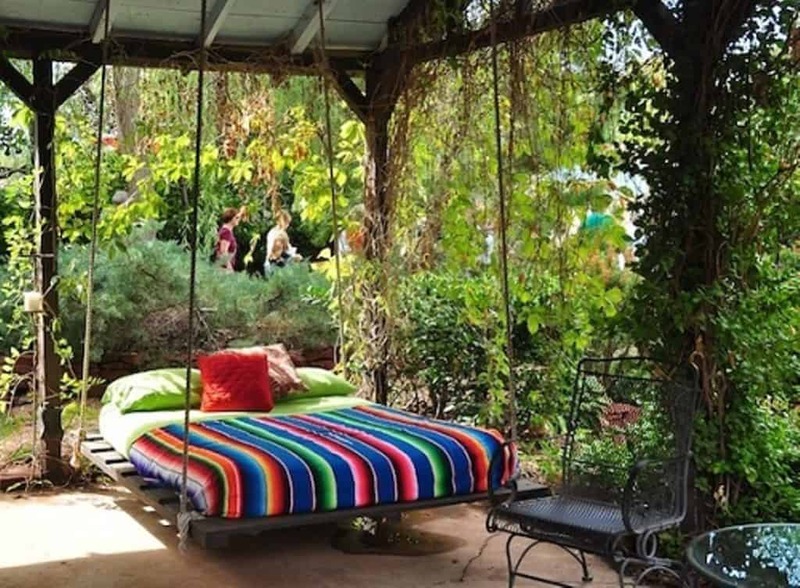 Another terrific relaxing spot that can be built at almost no cost with some pallets. For an added touch of luxury, hang sheer curtains from the top pallet to act as a canopy and give some much needed shade. 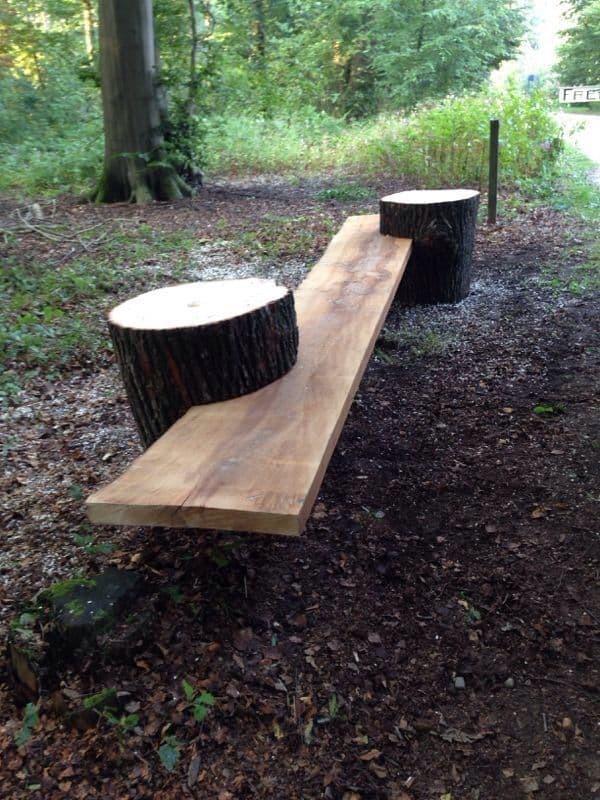 Cut tree stumps make a great foundation for garden furniture. Sturdy and secure, they can hold the weight of a good, heavy table top once it is attached correctly. For a touch of opulence, try using a marble or limestone surface. These feature chairs make a wonderful focal point amid the foliage of your garden. 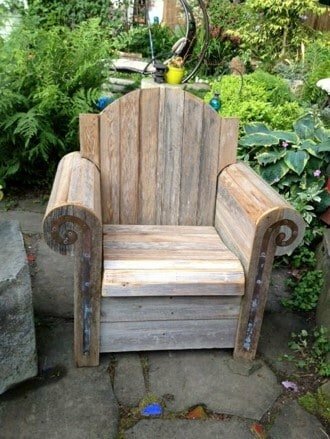 Use as a seat, or as a platform for a large colourful planter in the summer. No need to spend a fortune on a greenhouse or polytunnel for growing your fruit and veg. This greenhouse takes a bit of work, but is self-watering and raises the temperature by about 10 degrees. 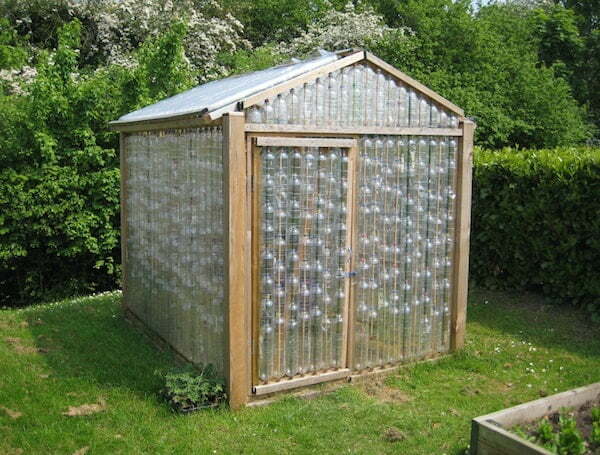 It typically takes 1400 2 litre bottles to build an 8×6 greenhouse. Mirror, mirror on the wall. Don’t throw out that old looking glass! Mirrors make a fantastic feature for giving added light and the illusion of more space. Positioning is the key, so hang it opposite a display of bright colourful flowers for optimal effect. Who said planters have to be boring? 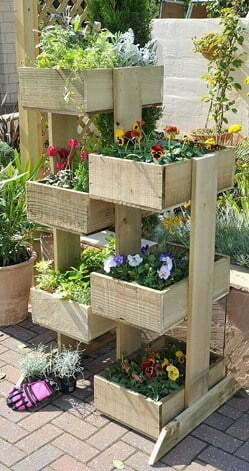 Make the most of vertical space in a small garden by building a wooden stacked planter frame. Line a few of these together to ‘wall off’ a defined area. Got a stack of empty paint cans lying around? Give them a lick of vibrant paint and create a colourful planter display to brighten up those drab fences or walls. 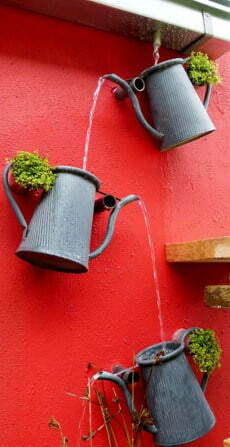 This idea works brilliantly as a hanging herb garden too! 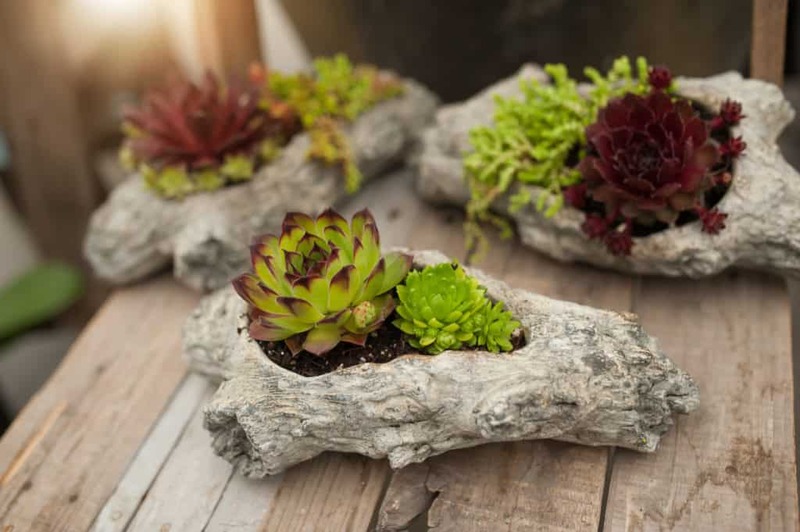 Pieces of driftwood make wonderfully interesting garden ornaments, but have you ever considered them as planters? They are ideal for succulent cuttings and air plants. They can even be mounted as a hanging display. 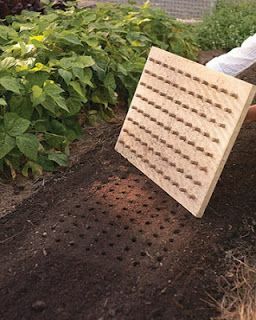 Save your aching knees and make planting your seeds a cinch with a seed planting board. All you need is a sheet of wood, old corks and some screws. Mark up your board with the desired seed interval and screw the corks in place. Easy peasy! Compost bins are great for helping the environment and your garden but let’s face it, they’re not the prettiest to look at. 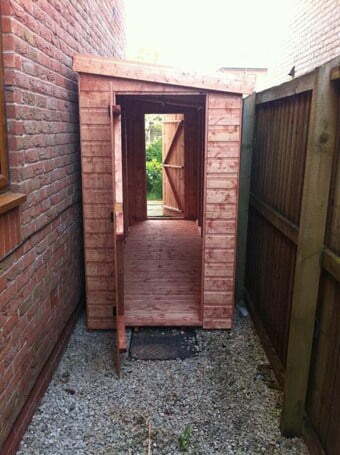 Turn yours into a feature rather than an eyesore by building it into a roof-opening wendy house. 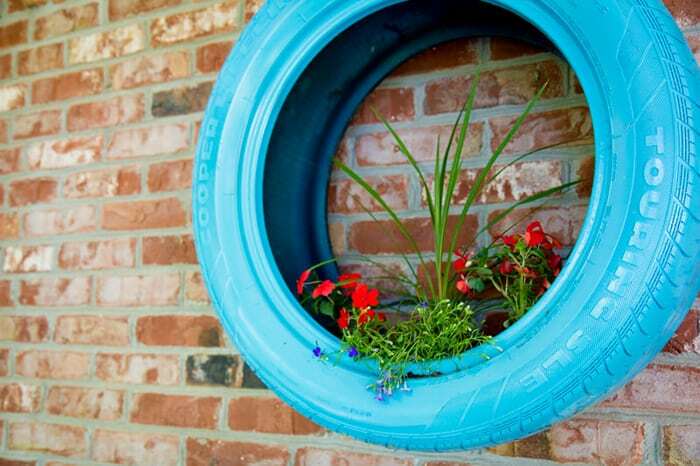 Another fantastic use for those old tyres! 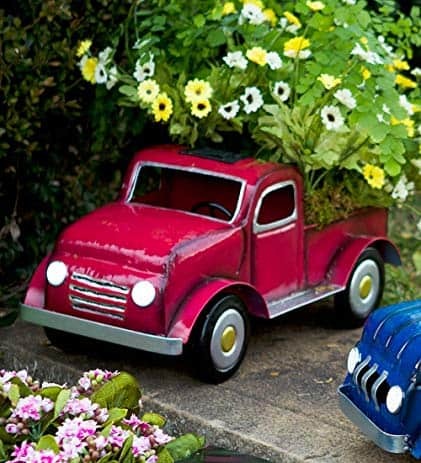 A coat of paint and a selection of bright potting plants will transform your old rubber into a unique hanging planter. Just remember to drill dome holes for water drainage. 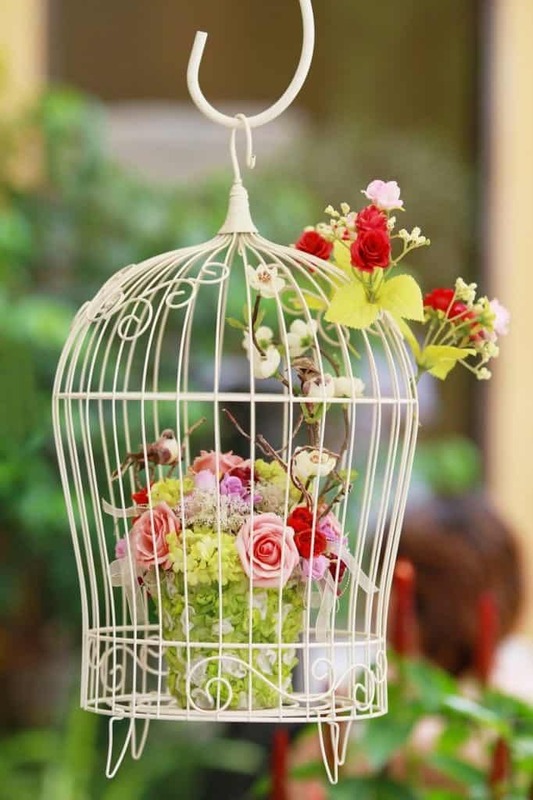 Remember when bird cages were in fashion and considered as ‘kitsch’ home décor? Well, that trend may be long gone but as it turns out, they make brilliant hanging baskets for trailing perennials. Perfect for hanging from porches! 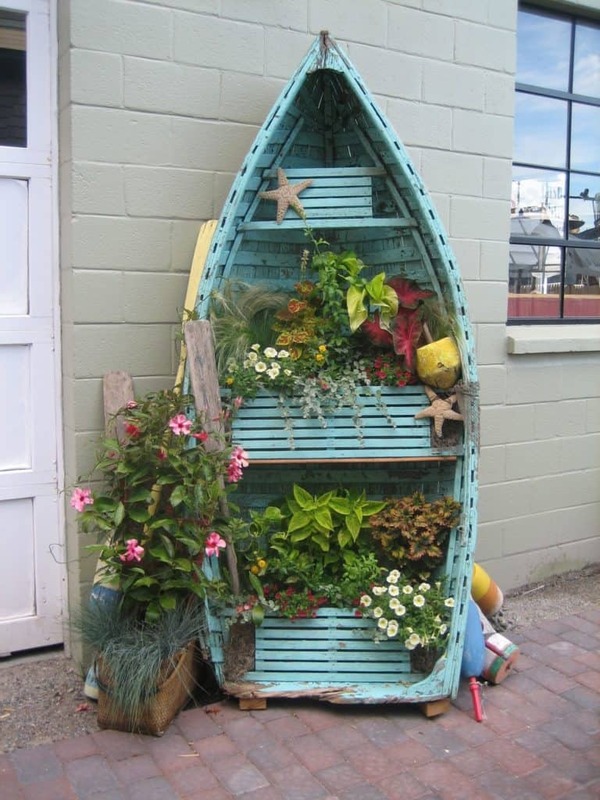 Nautical memorabilia makes fantastic garden features! Tenders that are too small to convert to seating are great as upright planter displays. 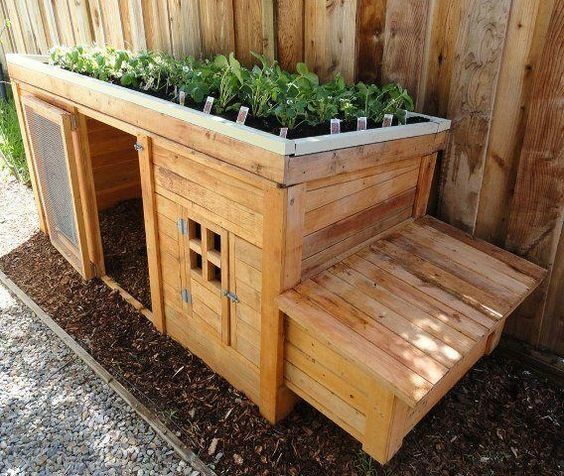 All you need is some pallet or crate wood to build a platform for the base and form your planting boxes. Sentimentally reluctant to discard those outgrown toy trucks? Plant ‘em up! They make great little boxes for succulents. You can even rope the kids in to help! Tired of being attacked by a pile of falling tools every time you reach for a shovel? This tool rack is so easy to make and will save your toes (and sanity!) a thousand times over. Ugly wheelie bins a blight on your garden landscape? 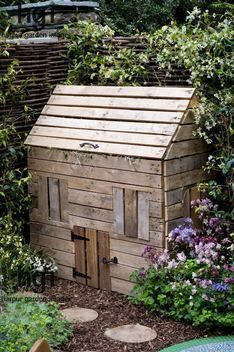 Brighten up your horizon by building them their own little shed, complete with a planter top. This is also brilliant for keeping rodents and pests at bay. It’s a win-win! Stuck for sheltered utility space? A double entrance shed is a great use of dead space if you have a side return on your house. Gain the extra storage room without compromising your through way. 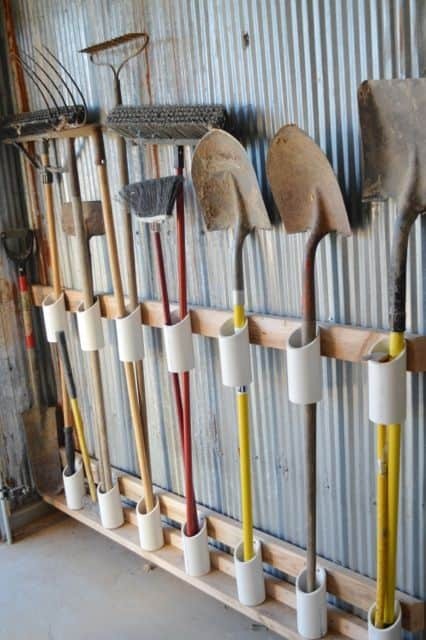 This is perfect for storing out of season garden equipment. Is your log pile taking over your entire garden? 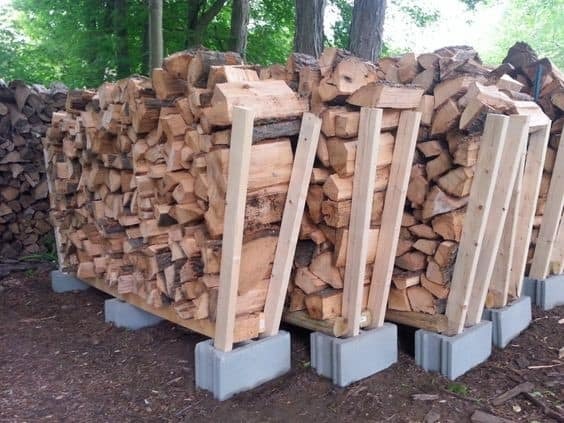 Take advantage of the vertical space and make some simple log storage platforms with some disused pallets and masonry blocks. 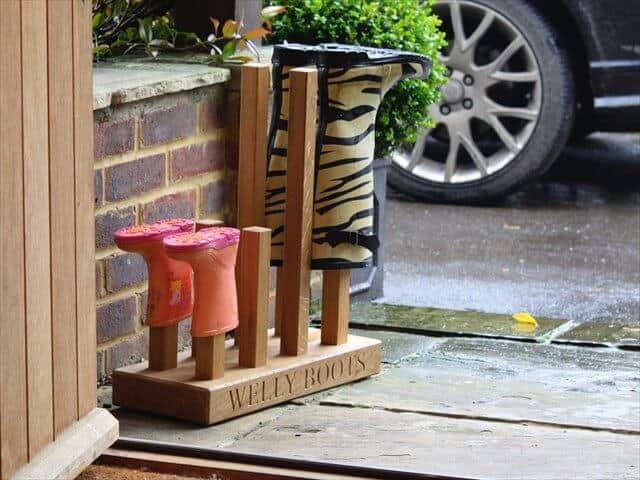 Your kids will never lose a wellie again with this lovely wellie rack. All you need is a few strong branches and a larger log split in half. If you want to go the extra mile, sand it down and paint to match the exterior of your house. You won’t find anything like this in your local garden centre! It’s a surprise then that this amazing feature is so easy to replicate. 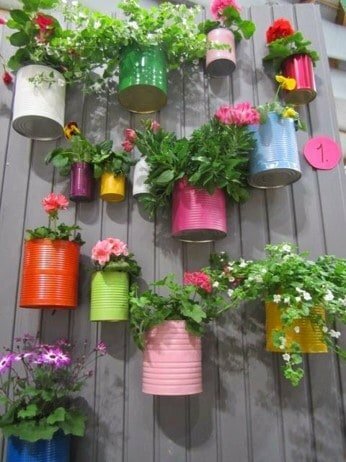 All you need is a few galvanized watering cans, a galvanized tub or water barrel, some water tubing, hanging brackets and a small water pump. Again, this is a lot easier to create than it looks. 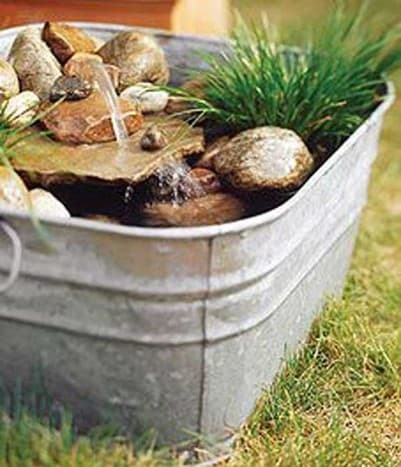 Get inventive with some old metal chutes and transform them into a quirky water feature. You can even add some water plants to the tub at the bottom. A hassle-free alternative to the conventional pond. Save your back from the trench digging by making your pond in a galvanized tub. A small water pump and some water tubing keep the mini-waterfall flowing, with some rocks to dress it up. Who said ponds had to be set in the ground? 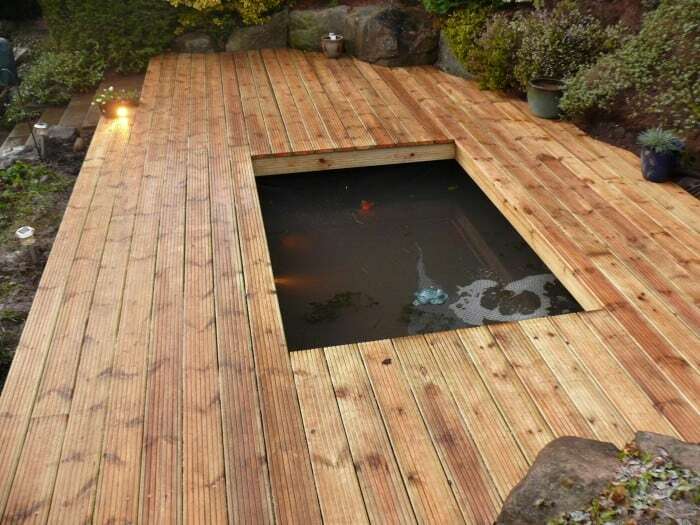 Relax on your decking to the sound of trickling water with this unusual water arrangement. This one takes a bit of effort but the results are absolutely stunning! Upgrading your bathroom? 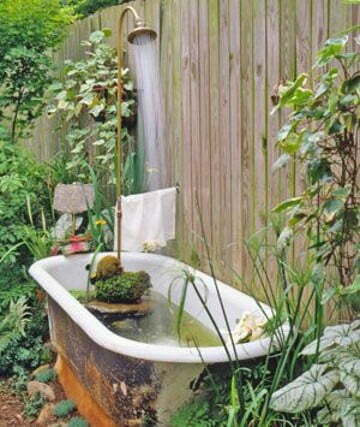 Don’t throw out that old bath! Create an easy inexpensive water feature with a small water pump and some water tubing. Brighten it up with a layer of enamel paint. 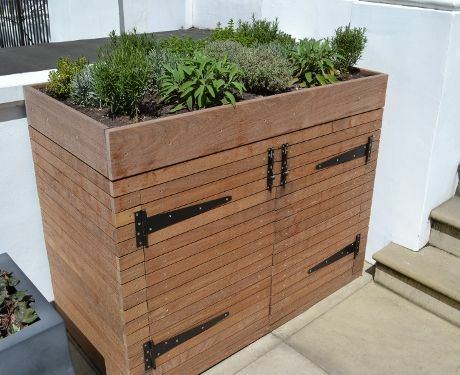 This is a wonderful feature for apartment balconies and concrete yards. 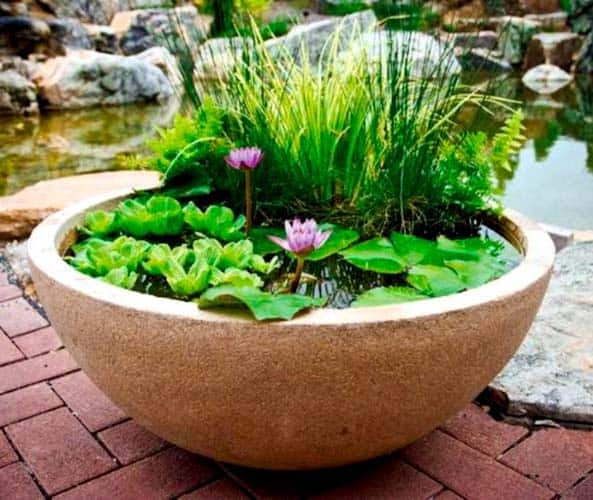 Choose a large container and fill it with aquatic plants such as water lilies and irises. If you’re feeling more adventurous, you could add a small water pump and create a fountain. Tea, anyone? 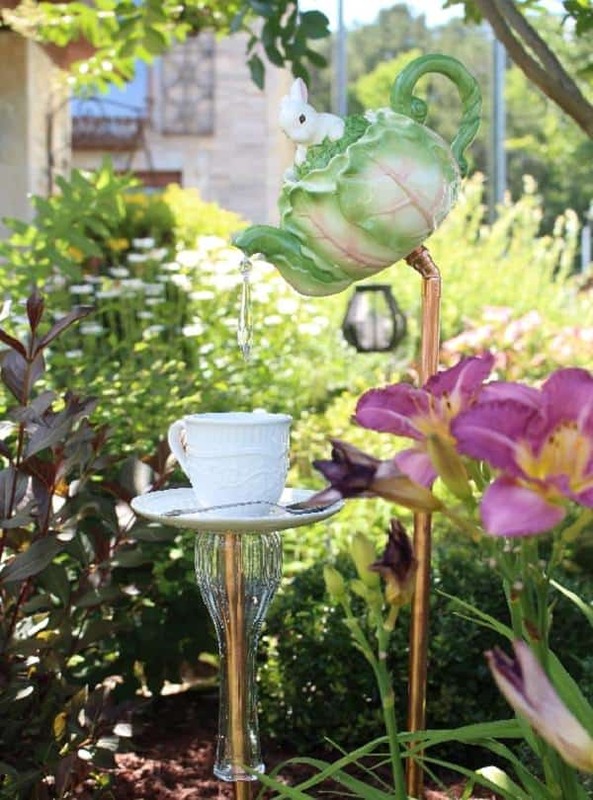 This unusual water feature is a great focal point for your garden. Surround with bright planters for an extra striking effect. This is a fantastic idea for repurposing an old, broken piano. 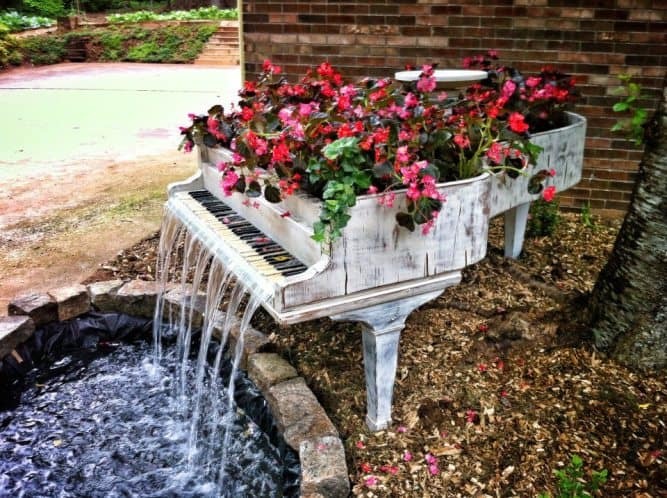 A piano waterfall is the ultimate garden feature for music lovers, lending a touch of class and uniqueness to your garden. It’s a masterpiece! Kids love messy sensory play. All the better in an outdoor setting, where cleaning up is quick and easy. 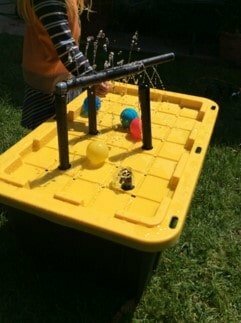 A simple heavy duty plastic storage box can be transformed into an amazing fountain water table with some pipes, water tubing and a water pump. It’ll keep the kids occupied for hours! Another one the kids will love. 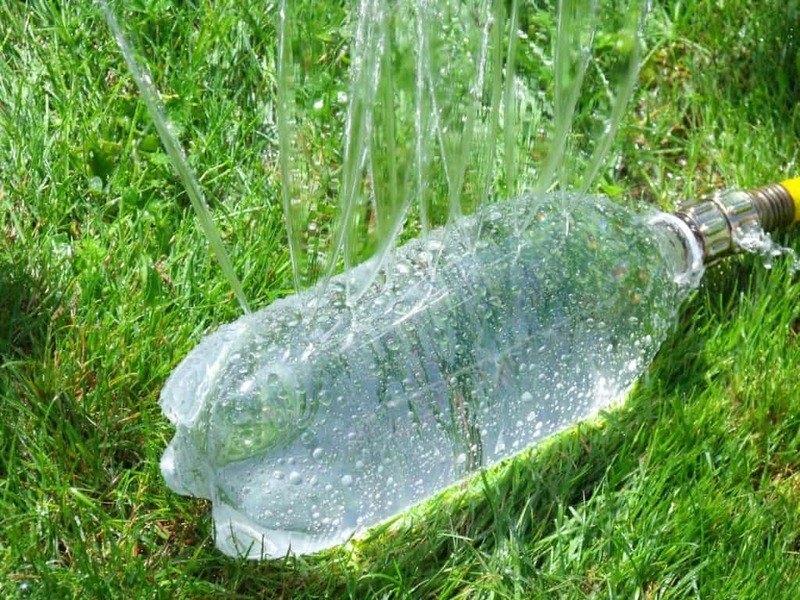 Keep cool in the hot summer weather with this DIY sprinkler. Simply punch holes in a 2 litre plastic bottle and secure a hose over the mouthpiece. The kids will have a ball, plus the lawn will get some much needed irrigation! A birdhouse with a difference. 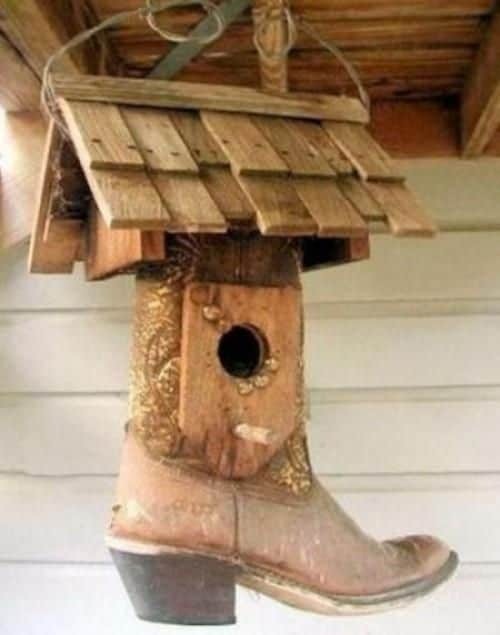 Repurpose those old work boots by using them to build an unusual nesting house. The material of the boots provides a lovely warm, insulated environment for the birds. 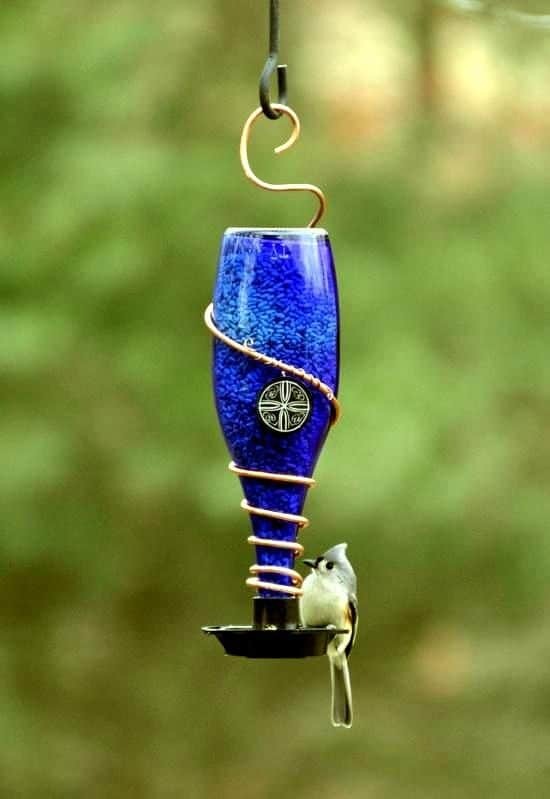 Bottle feeders are ideal for keeping the birds fed during the winter months. Any empty plastic bottle can be used and the kids will love helping you build and decorate them. Be sure to hang or mount them out of the reach of any prowling predators. 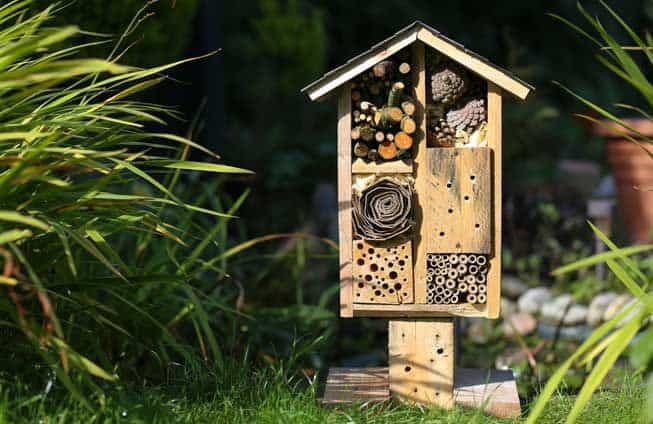 Bee hotels are fantastic for attracting solitary bees and other flying pollinators to your garden. Bees love little nooks and crannies so fill your hotel with a range of different textured tightly packed materials. Give Bugs the run he has always dreamed of by building a luxury rabbit hutch. Pallets are a great, inexpensive material for this project and you can even rope the kids in to design an interesting obstacle course for the bunny to navigate. 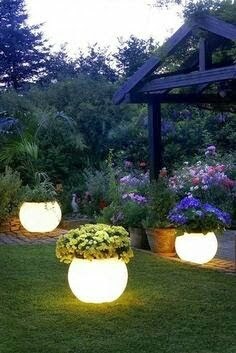 Take your outdoor lighting to the next level by painting your planters with glow in the dark paint. 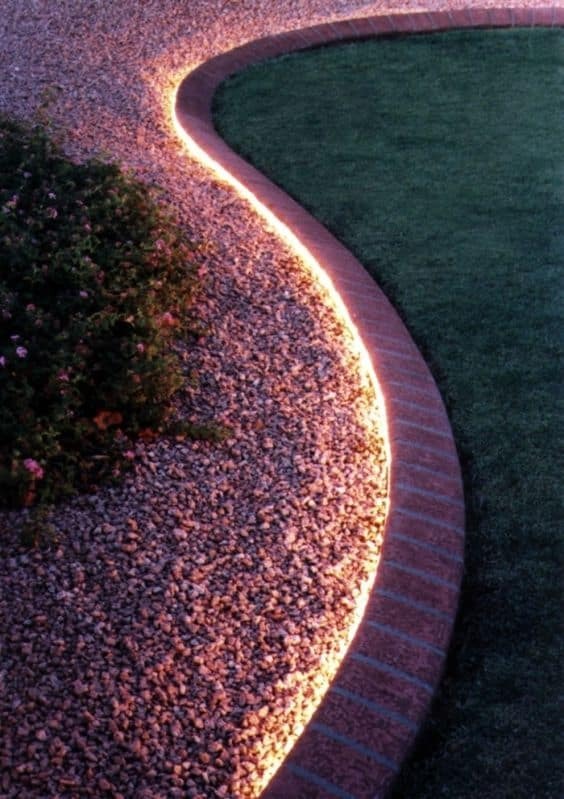 This is a great idea for a Halloween theme, or even just to illuminate a path in your garden. 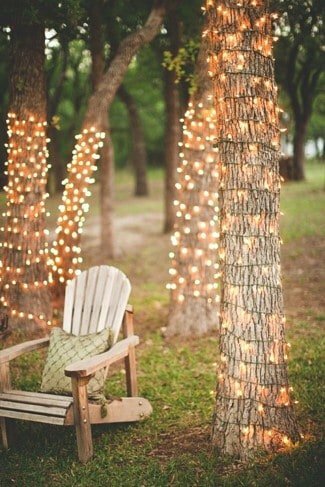 Outdoor fairy lights aren’t just for Christmas! Use them all year round to create interesting and magical displays. Wrap around tree trunks, pin along fences, drape across hedges, the choice is yours! Rope lighting can be used as a cheaper and easier to install alternative to ground lighting. Simply dig a shallow trench along the length of your paths and line with the rope lighting. Give your garden an ethereal air on those long summer evenings with some floating candles. 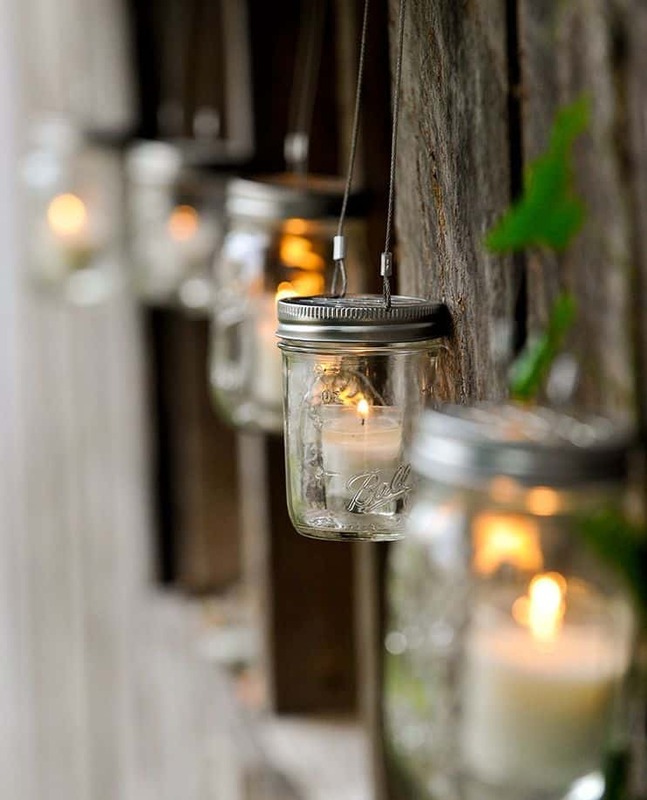 Masonry jars can be recycled as votives and hung from ground spikes. Perfect for garden parties and outdoor entertaining! Have lots of candles but you’re short on candlesticks? 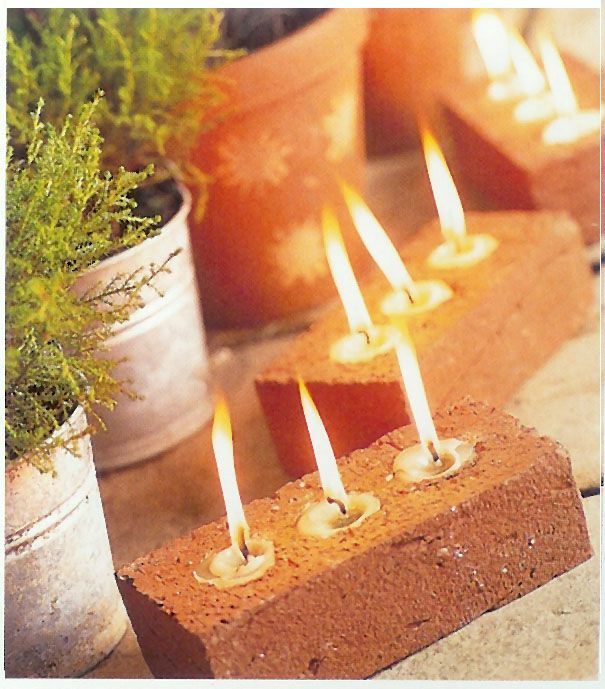 Use fire bricks as candle holders. Arrange along paths or on steps for a striking, unforgettable effect. Aluminium cans make great outdoor lanterns. 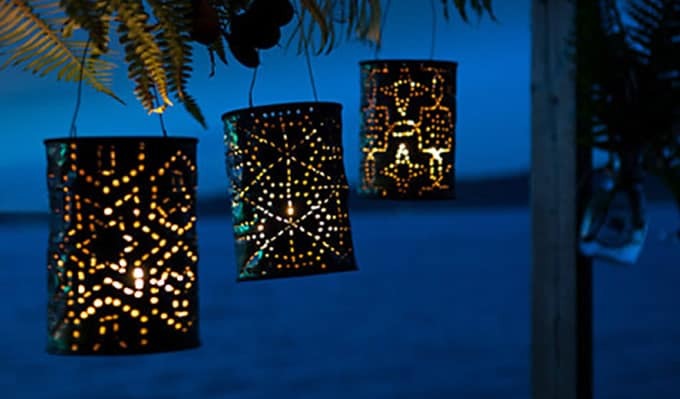 Use a hammer and nail to punch patterns into the cans to make beautiful, subtle lighting displays. It helps if you draw your pattern on a piece of paper beforehand and stick to the can as a guide. 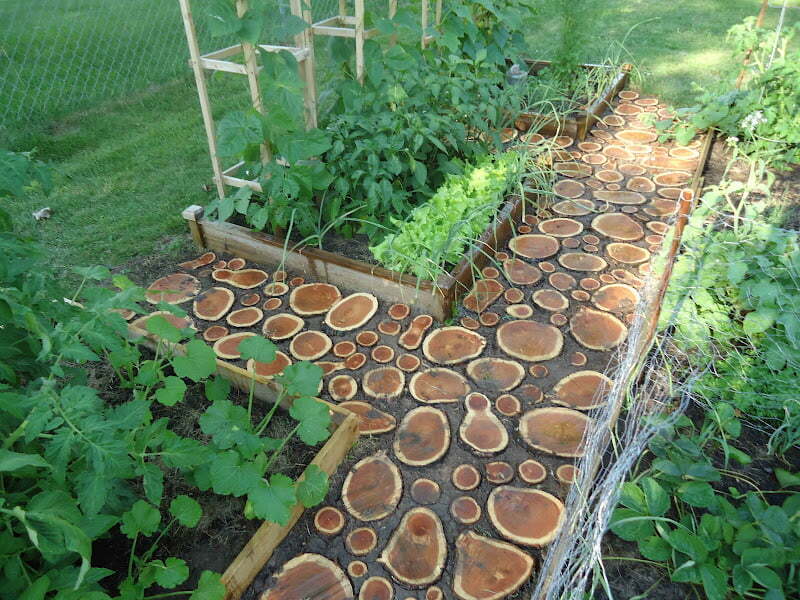 Create a magical woodland walkway in your garden with wood discs. You will need to coat the wood with shellac beforehand and do some digging to get the discs to sit smoothly in the ground, but the result is so fantastic it’s worth the hard graft! Your kids will love performing their showpieces on this custom built stage that doubles as seating. Or perhaps you just want to display your favourite planters on a platform worthy of their magnificence. Either way, the results are stunning. 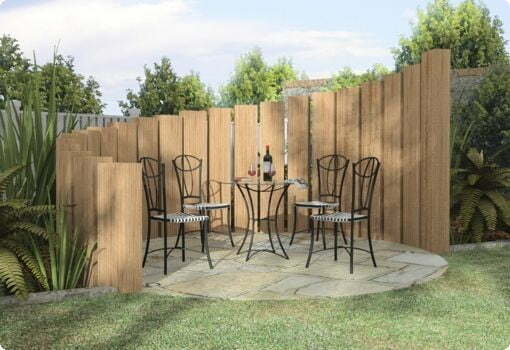 Define your outdoor dining area and give it a more intimate feel by enclosing it in a wooden fence. Using different heights of wood give it an interesting edge and stop it from feeling too walled-in. 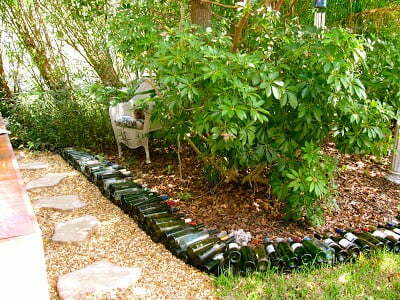 A wonderful idea for recycling green beer bottles is to stick them in the ground along the edge of your flower beds. This creates an unusual border that matches the colours in your garden. 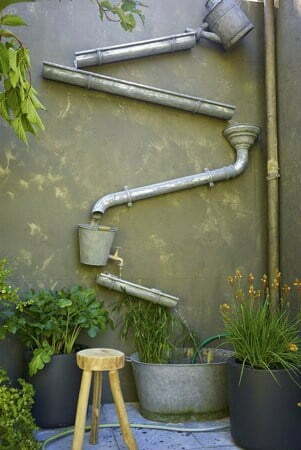 Ugly drainage can be an eyesore that takes away from the beauty of your garden. 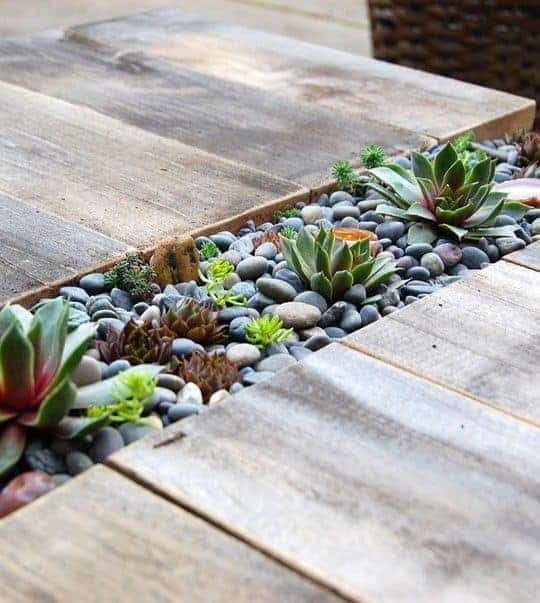 Brighten yours up by covering with a layer of pebbles and planting succulents and air plants along it. 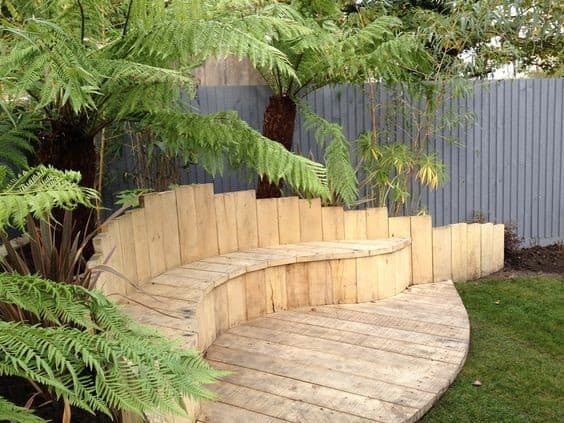 Construct a stunning foliage walkway in your garden! The frame can be built from wood, or by using garden wire over metal poles. Choose your favourite climbers and vines to line the frame. This is also perfect for climbing vegetables and fruits. This is a sundial with a difference! 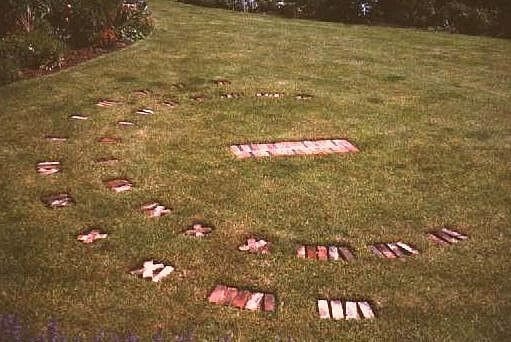 Use bricks to make the roman numerals and set into the ground. You tell the time by standing on the centre platform and casting your shadow along the timeline.